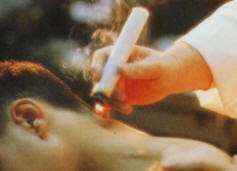 Moxibustion is a method of burning herbs on or above the skin, most generally at specific acupuncture points. The heat warms the energy and blood of the body and is useful in the treatment of disease and maintenance of health. Quite often pain and disease result from a blockage or improper flow of energy and blood. Moxibustion stimulates with heat identified areas to alleviate the original blockage and correct the flow. Moxibustion is an excellent treatment for sprains, traumas and injuries. In addition, it stimulates and supports the body's immune system, and can eliminate cold and damp areas, thus promoting normal function of the organs. Although it can be made from a variety of herbs, moxa (short for moxibustion) is generally made from the mugwort plant (Artemesia vulgaris). This herb burns easily, produces mild heat and allows for deep penetration through the skin and into the body. Mugwort comes in a variety of forms including loose wool-like tufts and shaped cones or sticks which are often called moxa cigars. The use of Moxibustion developed many centries ago in northern China and ss part of traditional Chinese medical practices; it evolved at about the same time as acupuncture.